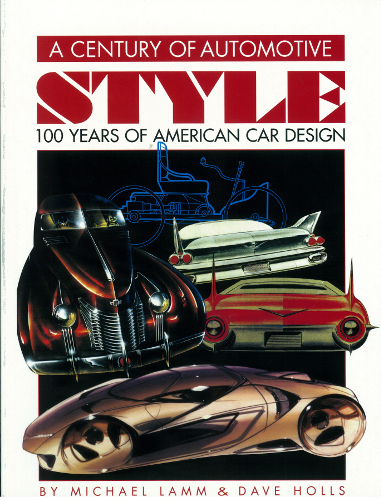 Written by Mike Lamm and the late Dave Holls (a former GM design director) and first published in 1997, A Century of Automotive Style: 100 Years of American Car Design is an in-depth history of the practice of automotive design in the United States. The 300+ page book begins with the American coachbuilders and then chronicles the development of in-house design studios at the various automakers, including the independents. There are also sidebars on important technical developments, such as the use of clay models. Part of what makes this fascinating and highly enjoyable book so valuable as a resource is that it draws heavily on primary research: interviews with retired designers, many of them now deceased. Therefore, you get an insider’s perspective on the personalities and behind-the-scenes machinations that helped to shape the styling trends. Therefore, I was pleased to hear that Mike Lamm has announced a new 500-copy limited print run of the hardcover edition. It’s available through Amazon.com or through the Lamm-Morada website for $69.95 (which if memory serves is about what I originally paid for my softcover edition more than a decade ago). It’s well worth the investment. This is not a paid endorsement — I received no compensation or gifts in kind for making this announcement and I have no financial stake in the publication or sales of the book. I’m just happy to recommend an exceptional volume by an author whose work I’ve long admired. This is great news. I missed getting a copy the first time around. I’ll definitely be ordering one. Thanks for the info, I wouldn’t have found out otherwise. I love your site and read it all the time. Maybe it isn’t a coincidence that I also have this book. If you like this site you will love A Century of Automotive Style. Thanks for the post. The book is wonderful and Mike Lamm fulfilled my order promptly and courteously.